For every $50 order in my Online Store, you will get 1 punch. When you’ve reached $400 in purchases (pre-tax and shipping), you will get to pick one free stamp set at any price level from the Catalog. You will get one punch for every $50 increment in your order, not including the shipping or tax charges. Punches cannot be carried forward to the next catalog year. You have until the end of the current Annual Catalog (5/31/17) to fill your punch card. Starting June 1st 2017, the punch card will run 12 full months – until 5/31/18. You will need to keep track of your purchases. When you’ve collected your eight punches, contact me to get your free stamp set. It will be shipped to you at no charge. You cannot pick a “bundle” as your free stamp set. 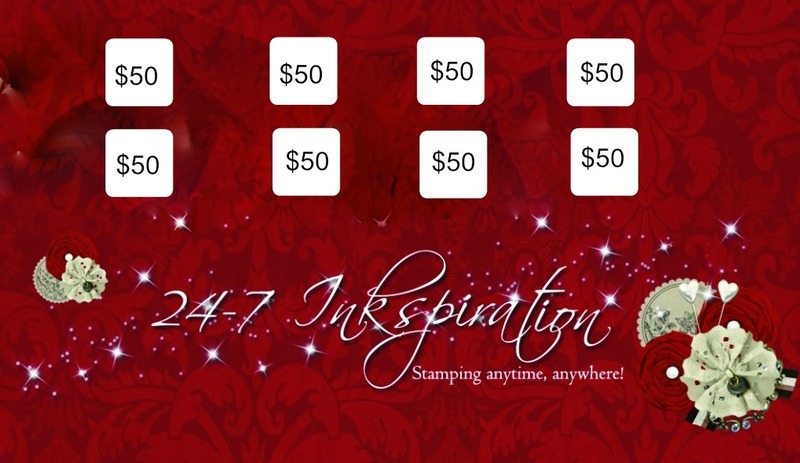 This promo is offered soley by 247Inkspiration, not Stampin Up. You cannot redeem these rewards through any other Demonstrator. Please be sure you are shopping with me if that’s your intent.